Leaf lanceolate, to 12 cm long and 18 mm wide, hairy. Inflorescence to 45 cm high, rarely more than 2-flowered, hairy, wiry. Sepals and lateral petals to 7 cm long, with 3 reddish stripes; tails often more than half the length of the segments; sepal tails ending in clubs that are short (5 mm long), narrow and yellowish; lateral sepals and petals obliquely deflexed (sepals tend to cross). Labellum more or less ovate, to 20 mm long, to c. 20 mm wide, 3-lobed, greenish with maroon tip; lateral lobes with linear, curved teeth to c. 8 mm long. Central calli linear, club-like, congested, in 4 rows. 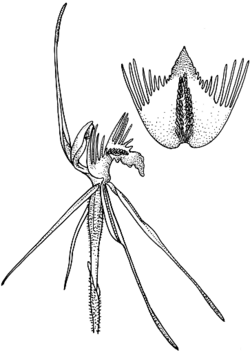 Column base with 2 yellow glands and large, flaring wings. Distribution and occurrence: West to Hillston district. Grows in a wide range of habitats but most common in sclerophyll forest or woodland on sandy to rocky soils but also on clay loams. Previously confused in N.S.W. with C. dilatata R.Br. var. dilatata.